Where would music be without love? Love, in all its forms, has been a prominent theme in music since, well, forever. Although there are no statistics per se, it seems plain to everyone that love and the excitement it brings (not to mention the heartbreak that comes when it goes) have directly (and sometimes indirectly) influenced music and musicians for as long as music has existed. Today, we are bringing you records that cover all sides of the spectrum. From love and lust to heartbreak and denial, here are two heartbreak records (along with a lovesick one). Label Owner: Bill Simon. 157 West 57th St., New York, NY. (1962-1963). 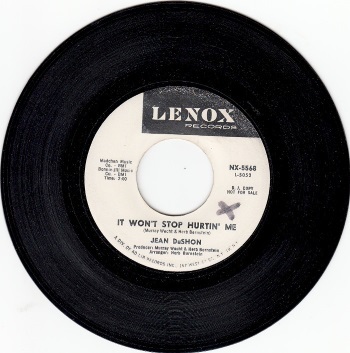 If the title wasn’t indication enough, Jean DuShon’s “It Won’t Stop Hurtin’ Me” has a heavy heartbreak at its center, despite the upbeat tempo and bright sound. Interestingly enough, this song has been classified as “Northern Soul Popcorn” by some, and they’re not talking about the movie snack. Popcorn music, also called Belgian popcorn or Belgian northern soul, is music that was frequently slowed down and played on a Belgian radio station called The Popcorn. These songs typically had a very specific groove. Today, popcorn music is more commonly called popcorn oldies. One last fun fact: The Popcorn took it’s name from James Brown’s The Popcorn LP. DuShon’s “Look the Other Way” has also found itself in popcorn oldies collections. The bounce typically associated with popcorn music is much more pronounced on the record’s B side. If the first song was sad and self-pitying, the second one marks progress. The singer acknowledges that her ex-love has hurt her and that she should “look the other way” to avoid hurting herself. Though she knows this, she can’t bring herself to do it. Label Owner: Label Owner: Otto Heinman. 1473 Barnham Ave. Bridgeport, Ct & 799 Seventh Ave, New York, NY (1951-1970). Walter Jackson was an inspiration to many. A severe case of polio as a child left him crutch-ridden for the rest of his life. Despite that, he went on to have one of the deepest, richest voices in soul. Unfortunately, Jackson died young. At only 45 years, he passed due to a cerebral hemorrhage, which is bleeding that happens within the brain. However, his music carries on his legacy. 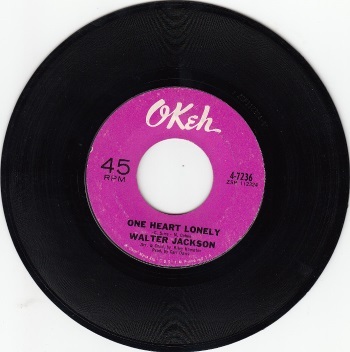 “One Heart Lonely” begins with a powerful opening that doesn’t let up. Trumpets and snare drums blast into the forefront before taking a backseat to Jackson’s booming voice. Despite being sad at its core, the upbeat tempo of the song and the lift of Jackson’s voice leaves you feeling a sense of hope and resilience after everything. At first listen, you might think “Funny (Not Much)” that this song is less about love and more about having moved on. And it’s true that the song features lyrics such as “I can pass you on the street and my heart don’t skip a beat” and “Now that you’re standing here, darling, I don’t shed a tear.” However, give this one a few more listens (or maybe read the lyrics) and you’ll see that the song is actually the singer’s halfhearted attempt at veiling their hurt. Three things give this away. First, the singer is actually crying when he insists he doesn’t. The lyrics that follow “Darling, I don’t shed a tear” are “This is just the rain in my eyes,” which is clearly untrue despite the singer’s insistence. Second, the song is descriptive enough that it’s clear the singer is thinking very much about the things he purportedly doesn’t miss, such as in the line “And it’s funny I don’t miss all the heaven in your kiss.” Finally, the song’s message isn’t “I don’t love you,” it’s “I don’t love you that much.” The singer constantly tries to downplay that parts of himself that don’t love someone anymore through his inclusion of “not much” throughout the song, but this only highlights how much trouble he actually has letting go of his former love. Label Owners: Joe Cuoghi, Nick Pesee, Willie Mitchell & Carl McVoy. 425 Commerce Title Building, Memphis Tn. (1958-1977). Of the three 45s in this article, this final one is the most obscure. This was one of Janet & the Jays’ three releases, and not much about the group is known (aside from their individual names). They only recorded over the course of three years. Still, Janet & the Jays put out some music that stands with the other 45s on our list today. Where the other songs in this article deal with heartbreak, “Love What You’re Doing to Me” is an exultation of the thrill of new love. The more cynical among you might note that, because this is a song about new, not established love. Perhaps the sort of heartbreak expressed by the other artists isn’t too far off. Either way, it’s difficult not to tap your foot while listening. If “Love What You’re Doing to Me” carried sexual undertones, “Pleading for You” takes things five steps further. “You know I need your kiss” is one of the first lines of the song, and that was a much stronger statement in the ‘60s than it is today. Faint electric guitar and quick, hard bursts of trumpets decorate this song while Janet and her background singers fill the remaining space.